The ministry of Open Doors has its origins in one man and one journey. In 1955, a young Dutchman went to Warsaw and discovered the existence of a persecuted church. He became known as Brother Andrew, and from 1955 to 1967 he travelled throughout Eastern Europe, delivering Scriptures, encouraging persecuted believers, and recruiting others to help him. The publication of God’s Smuggler in 1967 catapulted Andrew to worldwide renown. An entire generation caught the vision of supporting the persecuted church. This vision soon pushed the ministry beyond the Soviet Union. Open Doors grew in the 1970’s due to the international travel of Andrew, who met and recruited ‘mini-Andrews’ to work among the persecuted in Africa, Asia and Latin America. In particular, the Love China conference in 1975 brought the issue of Christian persecution in China to a much larger audience. And it was in China where one of Open Doors most famous projects took place – Project Pearl, where a staggering one million Bibles were delivered in a single night in June 1981. In 1982, Open Doors launched a seven-year campaign of prayer for the Communist Bloc. Seven years later, in 1989, the Berlin Wall fell and the world changed. Nevertheless, there were still Christians suffering in other Communist lands, such as China, Vietnam, North Korea, and several African states. Meanwhile, Open Doors had long been aware of growing persecution in the Muslim world. Brother Andrew visited Saudi Arabia as early as 1973 and had been warning of the need to make the church under Islam a greater priority all through the 1980s. Increasingly, Open Doors turned towards supporting the church in the Muslim world. Supporting the church means more than delivering Bibles. In 1978, the first training manual for leaders on how to resist persecution was produced for Christians in Asia. In the 1990s a training institute was established for pastors in sub-Saharan Africa. Open Doors also developed a global training programme for persecuted church pastors. This became Standing Strong Through The Storm (SSTS), first published in 2001 and still in use around the world today. At the same time, Open Doors Socio-Economic Development (SED) programmes helped persecuted Christians in other ways. Literacy projects were launched to help Christians read and study the Bible. In 1998 Open Doors launched its first major relief project - ‘Operation Daily Bread’ - to fly in food and supplies to remote areas of war-torn southern Sudan. Today Open Doors provides relief aid, livelihood support and community development projects for hundreds of thousands of Christians around the world. One of the big challenges in the post-cold war world was the rise of religious nationalism. Hindu extremists came from nowhere to form an elected government in India in 1996. Sri Lankan Buddhists began persecuting rural Christians, and guerrilla groups expanded their violence in places like Colombia. religious nationalism continues to be a major factor in persecution. In the late 1990s, Open Doors also began developing more targeted advocacy work. 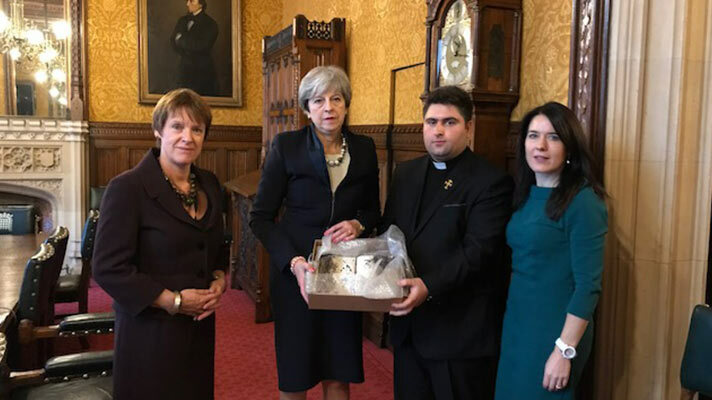 Since then speaking to the powerful on behalf of the powerless has become a core part of our work, from speaking to the Prime Minister to equipping the local church to know its legal rights. Perhaps the peak of this so far has been the Hope For The Middle East campaign, where a petition of 800,000 signatures was delivered to the UN and to governments around the world, calling for Christians in Iraq and Syria to have the right to equal citizenship, dignified living conditions and a prominent role in reconciling and rebuilding society. In the six decades since Brother Andrew’s first journey, Open Doors has continued to seek out and strengthen the persecuted church. And it’s only with your support that we can do this. Your help enables Open Doors to serves millions of persecuted Christians in over 60 countries, working with churches and local partners to provide Bibles, Christian materials, training, livelihood skills and advocacy. Today, more than ever, persecuted Christians need their brothers and sisters to make the same journey. Are you willing to walk alongside them? Are you willing to pray, support and speak up for the persecuted church? Then this is the moment to start! The Most Revd and Rt Hon Justin Welby, Archbishop of Canterbury.